BBC America last night aired the return of “Primeval” for Season 4 — and based on this episode, it’s a far better show than Season 3, which saw Connor and Abbie stranded in the Cretaceous Period, and many of the main characters dead. Remaining are Ben Miller, Ben Mansfield, Andrew Lee Potts, and Hannah Spearritt. There’s a new team leader, a computer whiz, and a mysterious man. In one of the most drastic cast-overhauls I have witnessed on a returning series, I am happy to report that all is well in Primeval-land so far. The new cast mixes in the humor of Series 1, with a new added grittiness reminiscent of Fox’s 24. Without giving away any major spoilers — Connor and Abbie return and are a couple, there’s another great dinosaur chase sequence, and the drama has been re-established. The special effects are also a notch better than past episodes (especially compared to Season 3’s terrible green-screen work). I was afraid that Primeval was a series that was better left for dead — but the return indicates there is some spark in this show yet. The only major surprise? That American tv has not yet already purchased and remade the show for American audiences. Witness Being Human on SyFi starting this week. 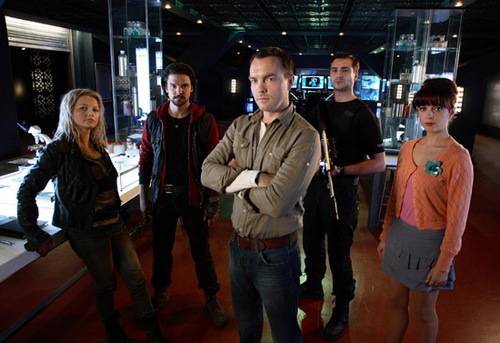 UPDATED: The new Series 4 of Primeval continues it’s superior entertainment — Ciarán McMenamin as team-leader Matt is as good as you could want, and the entire cast has really come into its own — but the thing that differentiates this season from those previous is the superb CGI work. It’s amazing. Watch the show and you will be hooked.